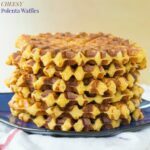 A savory waffle recipe makes a delicious side dish or serve it for breakfast or brunch topped with eggs. 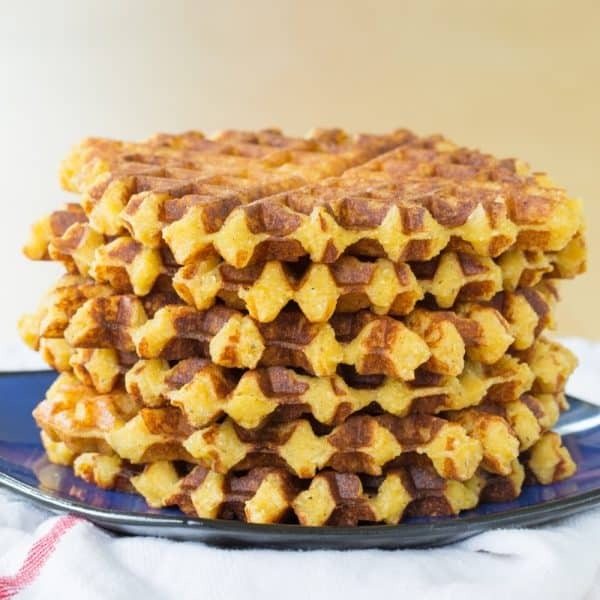 It’s National Waffle Iron Day, and National Waffle Day is later in the summer, so #SundaySupper is getting you ready with over 35 sweet and savory waffles for breakfast, lunch, dinner and dessert. 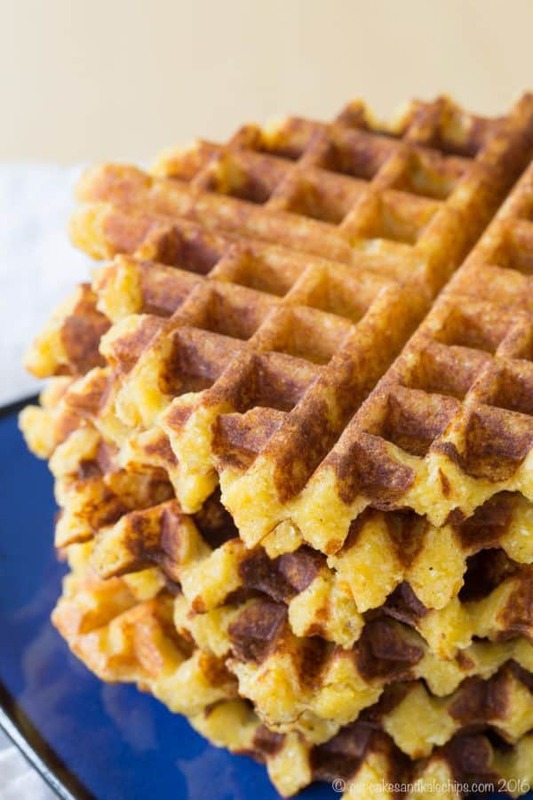 For a crispy twist on an old favorite side dish made with cornmeal and sharp cheddar cheese, you can call these Cheddar Grits Waffles, but today I’m calling them Cheesy Polenta Waffles. Registering for wedding gifts makes you do crazy things. It’s like once you have that little scanner in your hands, Martha Stewart suddenly takes up residence in your brain, and you have visions of guest rooms with 600 thread count sheets and down comforters and crocheted coverlets, tea parties on the veranda, and dinners for twelve where you break out the crystal and china to serve the perfect roast with a glass of the finest French red wine. Except you are in your mid twenties, you don’t even know what a coverlet is, you don’t have a veranda, your dining room can barely fit six people, and you are usually serving them flank steak on paper plates. In my case, I was realistic about the crystal and china, and instead opted for a set of nice but practical dishes and wine glasses, since I already had “everyday” plates. My kitchen was fairly well-stocked since cooking and baking had been my hobby for a few years. And, well, OK, OK, I did get the 600 thread count sheets, but that was really at the request of The Hubby who is really the thread count snob in the house. But we had our slightly out there, possible unnecessary things on our registry. Even though I’m not really into deep frying, The Hubby insisted on adding a fancy shmancy deep fryer which we have used once. But I can’t really be too upset with him because I insisted on the big Belgian waffle maker that you flip which I also think we have used once. OK, so maybe more than once, but not often. And part of the reason is that I just don’t want to drag out this ginormous thing to make a few waffles. Plus standard waffle batter doesn’t work all that well in it. You need yeast and stuff. And on a Sunday morning, who wants to be bothered with yeast just to make some waffles. OK, so the Italians and the Southerners may both beat me up for this, but I think these work as Cheesy Polenta Waffles or Cheddar Grits Waffles. They are made form cornmeal, the same way I make polenta, but aren’t cornmeal waffles because they aren’t cornbread-y. Tradition grits have a slightly different grind than plain old cornmeal (I think), but with the sharp cheddar cheese, they have that cheesy grits flavor. And they definitely work when you top them with barbecue or Cajun-style shrimp (I will share what I did another time). But they would also be great for brunch with a fried egg and some bacon. I’d also love to dunk them in a bowl of chili. 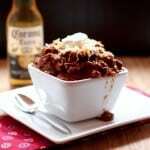 They have a toasty, nutty flavor from the cornmeal and browned cheddar cheese. They are crisp on the outside but soft in the middle. It’s totally time tochange up your polenta game. Or your grits game. Or your waffle game. Because seriously, guys, these rock. It’s so simple – just whip up a basic batch of polenta, stir in some cheese, and plop it into the waffle iron. 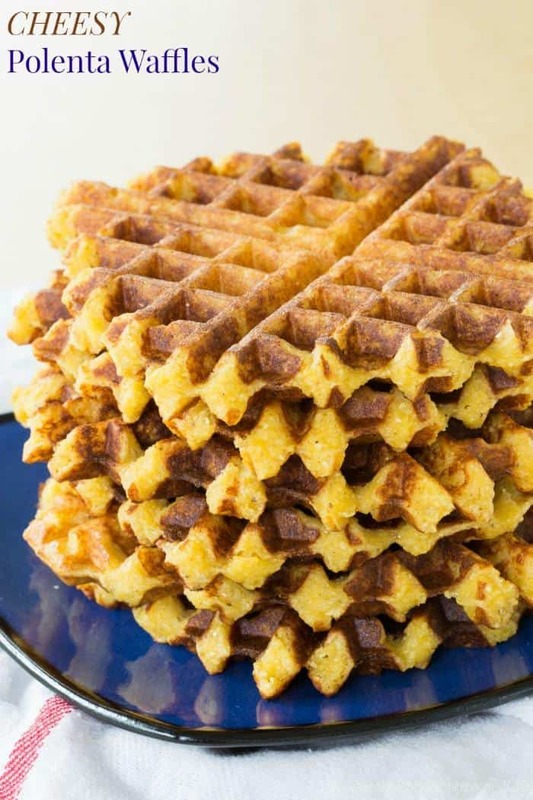 You may have to play around with quantity based on your waffle iron. They rise slightly, but not a lot, so you’ll need more than the standard waffle. If you add too much, it’s harder to get them crisp, but they are still good. You really can’t mess it up. 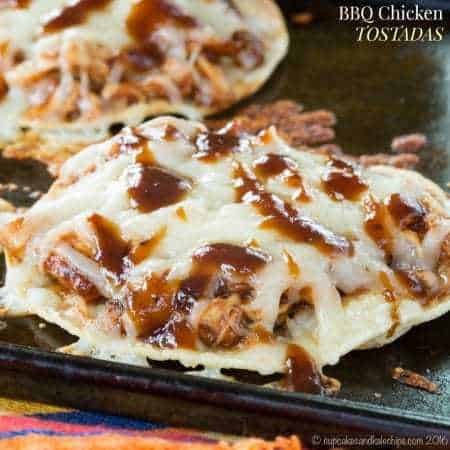 And if you have leftovers, they reheat fine in the microwave, but throw them in the oven or taster to get even more of that toasty cheese flavor. 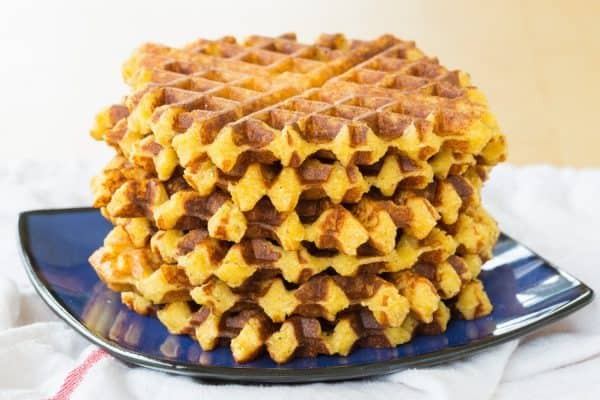 Then get ready for waffles at morning, noon, and night with the recipes at the bottom of this post. What crazy things did you put on your wedding registry? In a large saucepan, add the milk and butter and warm over medium heat until the butter melts. Continue to stir until the polenta has thickened and is pulling away from the sides of the pot, about 10-15 minutes. Reduce heat, stir in the cheddar cheese, salt, pepper, and cayenne pepper. 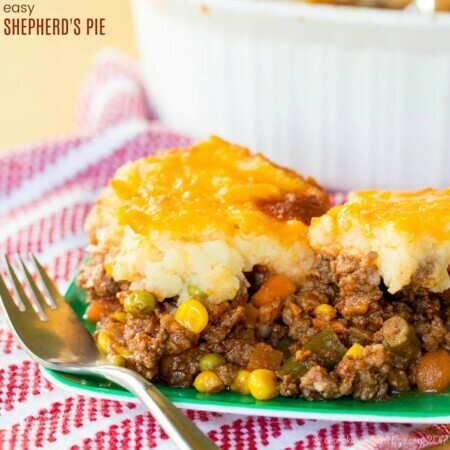 Remove from heat and stir in the egg, cornstarch, and baking powder. Lightly oil the waffle iron, fill with the polenta mixture (a standard waffle iron used about 1/2 cup of the polenta mixture), and cook as directed until browned. 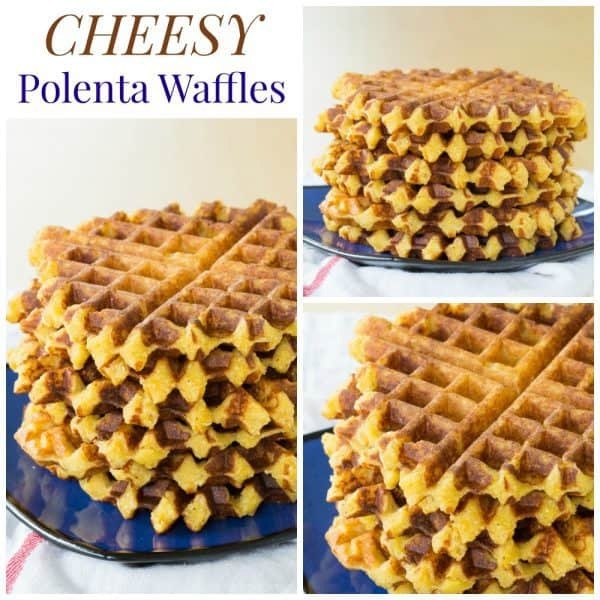 Enjoy this Cheesy Polenta Waffles recipe! I’ve only had polenta once before and it wasn’t done well. I’ve been avoiding it sense. Maybe I should try it in waffle form! 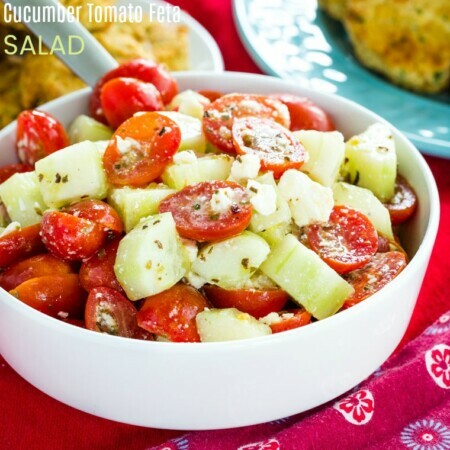 Do you think this would work with leftover polenta? This recipe is making my wheels spin. We make polenta for my Italian mother in low (who has alzheimers and can no longer make it herself) and she loves it. 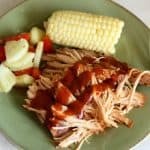 But we never seem to do much with leftovers. 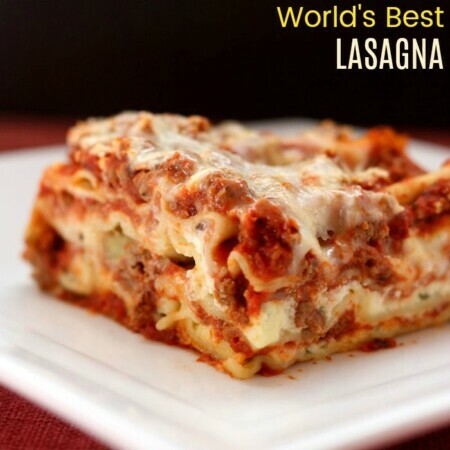 Blah, blah, blah, anyway this looks great and leftovers or not I’m making this one! 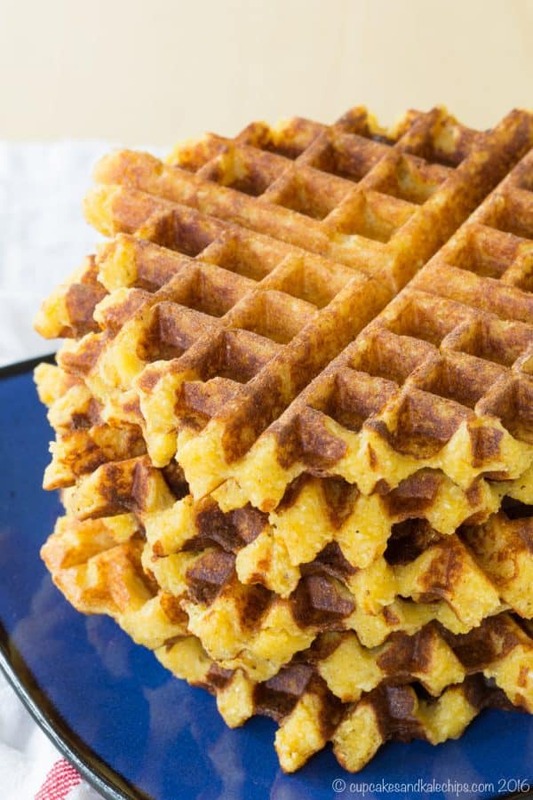 Denise, I think leftover polenta would be perfect to use in these polenta waffles! What a great way to enjoy polenta!